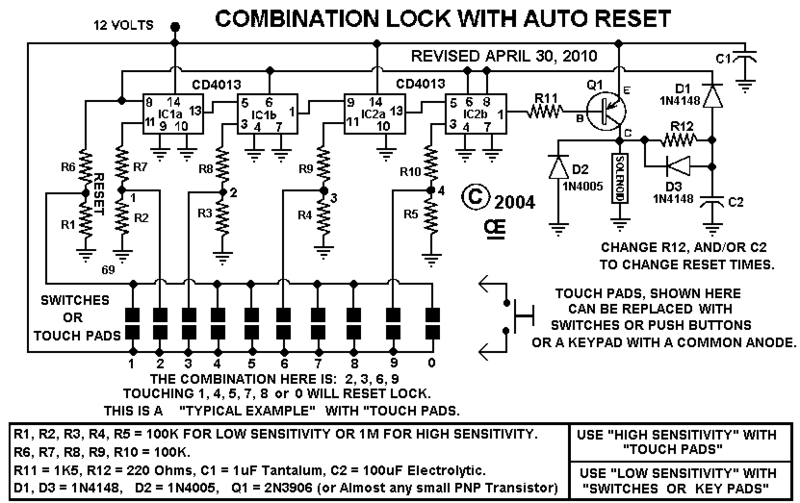 Schematic, Typo error Corrected, "April 30. 2010" Plus a Keypad Update. 9 to 15 Volt Operation. Can be used in a Motor Vehicle. C-Mos Design, Low Standby Power. Can be used with "Touch Pads", "Push Buttons" or a Phone type "KeyPad". NOTE:  High Sensitivity is NOT Required if using a "Keypad or Switches". So the 1M resistors can be Reduced to 100K values if so desired. For Really High Sensitivity, the 1M Resistors can be increased to 8.2M or even 10M. Optional "Auto Reset" after X number of seconds. NOTE: If you do not want this feature, leave off "R12", "D3" and "C2". And Changing R12 or C2 to higher values will increase this reset time. T0-220 PNP types of transistors. USE ONLY ONE OR THE OTHER, NOT BOTH. 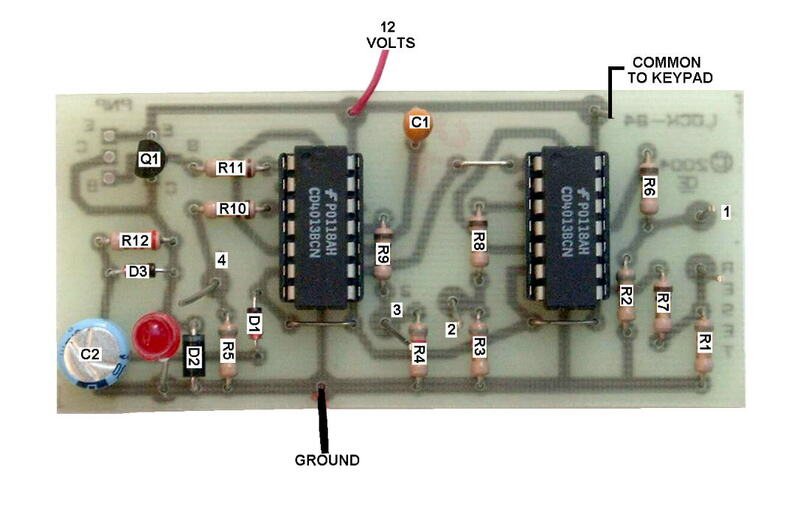 In the Picture, I just put a Resistor and LED, where the Solenoid should go. a Part Number 88AC2-162, Made by "Grayhill", But now its DISCONTINUED. Alternately Grayhill make others. Such a a 88AC2-172. Or go to www.grayhill.com to see what else is available. Remove All Traces of Solder FLUX from the board. will Continuously "RESET", Stopping you from opening it. Same Keypads on my truck and find they last about 10 years before needing replacing. solenoid. This is used to activate the solenoid and Exit the truck. A Common Anode Keypad or Switches of some kind. Back to "My HOME Page"